Virtual reality (VR) can often feel somewhat restrictive, both in terms of movement and the level of social interaction you can have while jacked in. That’s why location-based, free roam VR studios are so interesting. 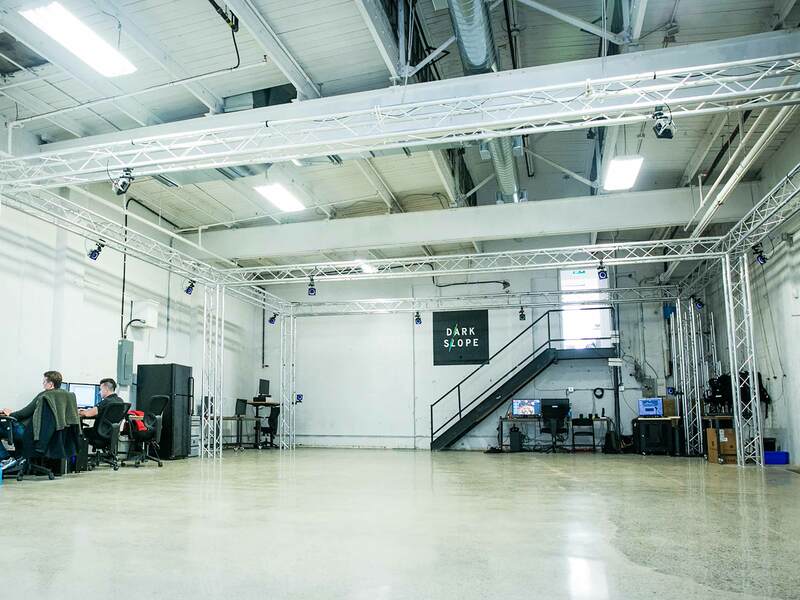 They let you take a group of friends or family and head on over to a large warehouse space for some fun VR experiences. The latest of these locations, Dark Slope, recently opened up shop in Toronto’s Liberty Village. In addition to being close to the CNE, this location also provided the team with a 2,000 sq. ft play area for free roaming VR fun. Currently, Dark Slope has one VR title that players can try out: Scarygirl Mission Maybee, based on Nathan Jurevicius’ 2009 Scarygirl graphic novel. The experience, which was overseen by Jurevicius, lets up to eight people team up with Scarygirl as she fights to stop the evil Dr. Maybee. 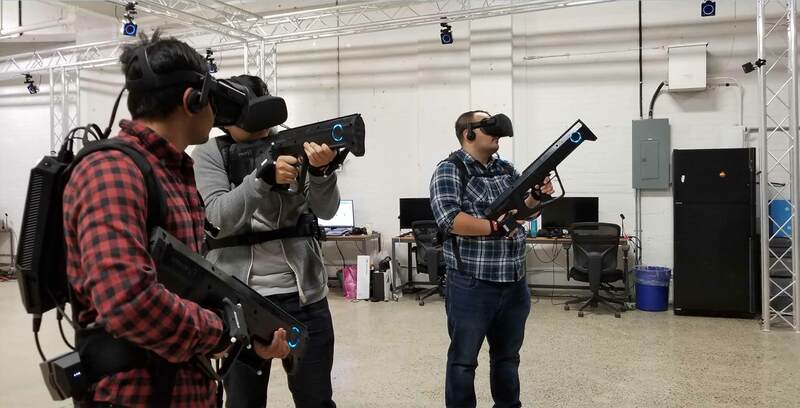 Before hopping in, though, you’ll need to suit up using a modified Oculus Rift headset, backpack computers and trackers that you slip over your hands and feet. Overall, setting up and wearing all of this equipment was a simple and comfortable process. Dark Slope’s tracking apparatus worked quite well. In other experiences, my friends’ avatars’ legs would move rather awkwardly when I looked at them, but here, animations were quite smooth. Further, the system takes each player’s height into consideration when creating their in-game avatars, which made me feel more connected to them since they closely resembled my friends’ actual height. Finally, you’ll be given a ‘Hydroflexinator’ physical gun through which most of the action comes from. 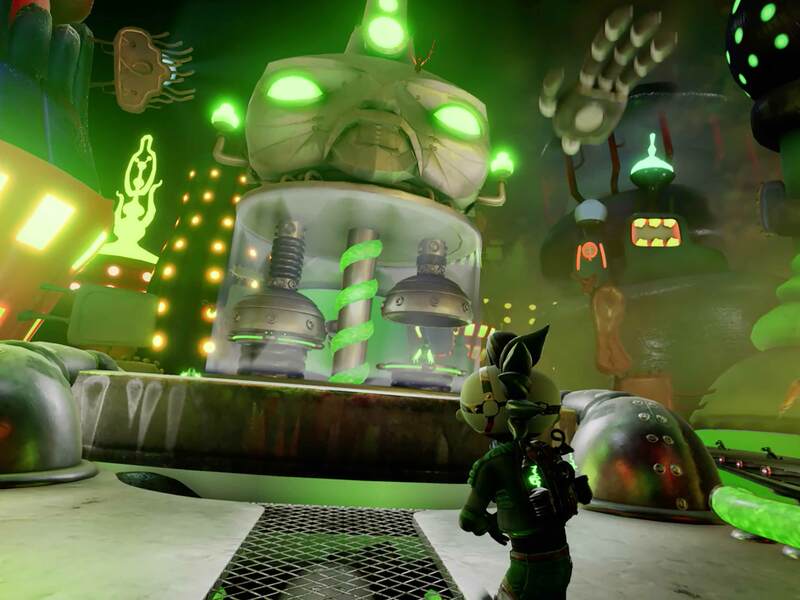 Once the game actually starts, you’ll have to walk through a guided path and use the triggers on the gun to disinfect animals and plants from Dr. Maybee’s hazardous goo. At the same time, you’ll be blasting away incoming flying creatures. More often than not, I find myself feeling removed from VR shootouts because the gun I’m holding doesn’t provide any sort of physical feedback. Here, I was pleased to find that the guns gave off a satisfying pulse every time I fired a round of water, adding another layer of immersion to the experience. I’ll admit that I wasn’t at all familiar with the Scarygirl property going in, but I did find the experience’s colourful world and quirky, Psychonauts-looking characters rather charming. Meanwhile, the actual combat is delightfully cartoonish and breezy. Altogether, one playthrough of Scarygirl is about 15 minutes long, which should be a solid length for even the most sickness-prone of players. Overall, my biggest takeaway is that Scarygirl is a great introduction to VR newcomers of all ages. To be clear, its family-friendly content might not appeal to veteran gamers or VR users, but I’m not sure that’s a problem. Scarygirl makes for a nice alternative from the majority of the more “adult” offerings found at The Void in The Rec Room, like Ghostbusters or Star Wars, or the more intense alien or zombie survival games at the likes of other Ontario VR outlets, such as Virtual Galaxies or VRPlayin. Dark Slope is also planning to add other games in the future. In the meantime, though, Scarygirl is a solid debut title for the studio and a fun experience for all. You can book a one-hour session for $30 CAD on Dark Slope’s website.